The weather has heated up and with the added time you spend outside in the fresh air, you’re maybe thinking that your living space is a bit cluttered. Or maybe you’re looking to move some things in now that you don’t have to brave icy sidewalks. 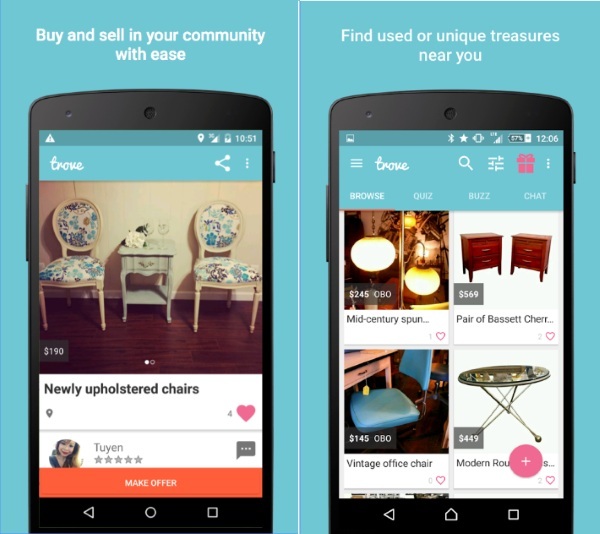 Either way, if you want to buy used and local then Trove the app to help you do it. Trove is a marketplace app that allows you to list home items for sell either as a local shop owner or just an individual looking to get rid of a few things. As a shopper, you can use it to find nearby gently loved or refurbished items that you want to purchase. Instead of just using Craigslist to grab a deal, this app helps you see seller ratings and profile so you don’t end up with a nasty case of bed bugs. You can reserve the items you wish to buy with the app and then, once you see them, purchase them that way as well. Don’t give your number to sketchy Craigslist people, Trove is the free app for Android.